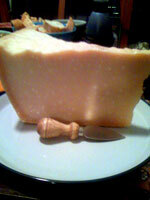 I brought back over 1 kilo of Parmigiano-Reggiano from Italy. It is such a beautiful thing, a giant wheel of cheese. Probably my favorite part of Italy was aparativo. Basically aparativo is happy hour, but in a much better way than we do it here in the US. You buy one glass of wine and then there is a large free antipasto buffet. Delicious! 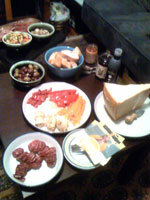 Cut all of the ingredients into bit size pieces and arrange them rustically across the table. The honey with the bread and cheese is divine!